Eric and I headed down to Festival of the Arts to see a band play, and eat some wonderfully wonderful kielbasa (Polish + proud over here!) and cheese pies. 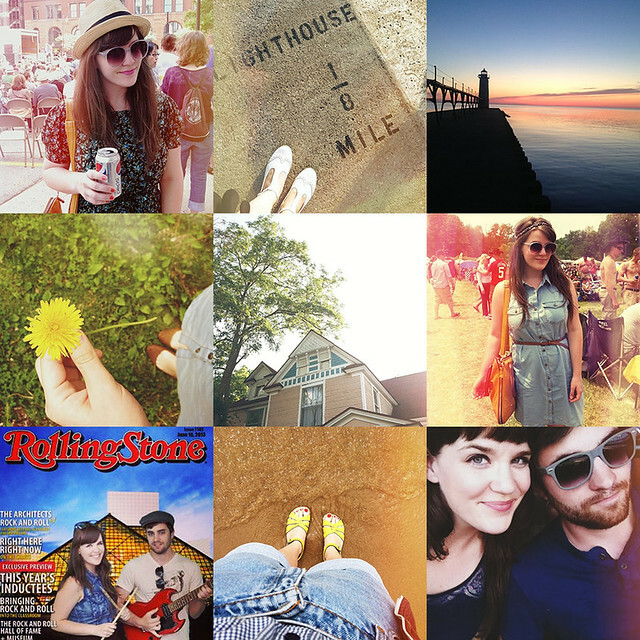 We took a trip up to Ludington North Pierhead. It was one of my favorite piers! And we also headed up to Manistee Pierhead Light to see one of the prettiest sunsets I've ever seen. We finally received some summer weather here in Michigan! We spent our last month at our current apartment. I went through a lot at this place and I'm honestly very ready to say goodbye and move on. I truly believe everything happens for a reason. We took a trip to Cleveland to see Fleetwood Mac and tour the Rock and Roll Hall of Fame. I honestly loved every second diving into the history of rock and roll. Such a fun day. We went to a work outing up at a cottage up north. Although it was windy + slightly rainy, it was such a great day spent with coworkers and friends. And just recently we headed to the east side for a Detroit Tiger's baseball game with friends. It was blazing hot and I fell asleep in my chair at the end, but it was a fun game. They won! July is going to be a crazy month. We are moving this weekend! Holy crap. We have 4th of July, which is my favorite holiday ever besides Halloween. I'm a sucker for fireworks and BBQ foods! We have a day trip up north planned to see a lighthouse, a super kitschy old drive-in theater and a few cherry-themed places. We're doing a concert and Bike Time with my family, and Eric is playing a few country shows at CoastWest and Back Forty. We're taking another day trip south to explore another lighthouse and a few dorky tourist spots. I'm also working on hosting a Madewell event on the east side of the state, I'll keep you guys updated! And at the end of the month, I will be turning 27 - ah! So yeah, I'm very excited. I just love summer. July is my month, for sure. Well, July and October. And May... aw geez, I just love the best month in each of the seasons, I guess. Ha!